Toshi Seeger's obituary last week in The New York Times brought a smile to my face. 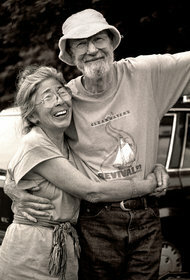 Toshi provided her husband, the folk singer Pete Seeger, with the organizational skills without which he would have not been so influential or commercially successful. That simple sentiment works in both directions. It helped make sure Pete Seeger would not become too big for his britches. It also communicates deep respect for the bulldozer operator — and for hardworking people more generally. One of many problems with the obscene income inequality that has emerged in the United States since the 1970s is that too many people in the "1%" (and the smaller groups at the very, very top) seem to have convinced themselves that they are not only deserving but also somehow different than — better than — other people. Economic elites and the broader culture have also come to respect much less the hard work of regular folks — the nurse's aide and the sanitation worker, the back hoe operator and the warehouse worker, the truck driver and the child-care teacher. Legislators and advocates for local government communicate this, for example, every single time they seek to cut the state's prevailing wage for construction workers. Along with their serial refusal to look at the ample evidence that paying construction workers decently does not increase construction costs, these proponents of weakening prevailing wage laws imply, again and again, "anyone off the street can do construction work just as well as experienced crafts workers." It's not true. It's deeply offensive. And it's sad that the people being so dismissive of other people's skills don't even realize how insulting they are being. Maybe a few folks reading Toshi Seeger's obituary will pause briefly to reflect on the moral compass that led her to equate her phenomenally successful folk singer husband and a good bulldozer operator. That would be a good thing.